Man with chainsaws for arms, and also chainsaws for legs. And he has a chainsaw head. His torso is also chainsaws. Kitchen in Haunted house full of Ghost Peppers. Alphabet Soup spells out the name of the next one to die. Is dyslexic. Evil doctor prescribes having your head chopped off; second opinion suggests otherwise. WHICH DO YOU CHOOSES?!? Masked killer spends quiet night at home. Clumsy agnostic is possessed by devil. Does not notice. Robots indistinguishable from humans except that they have metal skin and beep instead of talk. Mad scientist conducts experiments on bowl of brains. Is actually cold spaghetti. SEQUEL IDEA: It's dry spaghetti. A man has a tattoo of a skull. It's yours. Mysterious carnival staffed by monsters shows up in middle of night. Monsters are non unionized and park is unsafe. Carnival is shut down after successful lawsuit from broken arm. Monster so uninteresting that you are bored to death. Godzilla knows what you did last summer. Nine out of ten dentists agree: The tenth dentist is the murderer. Wait a minute... the tenth dentist... HAS BEEN MURDERED! Witch takes over local paper. Starts writing HORRORscopes. Scientist builds Frankenstein out of deli-meats. Vengeful man installs lightning rod on your house. Does a good job and your house becomes safe from thunderstorms. Vampire who feeds on vampires meets Frankenstein made of Frankensteins and a ghost who scares ghosts. Monster Mash is held. Is an eerie sight. Don Knotts meets wolfman. Is traumatized. Murderous Ghost hears name wrong; answers to Blobby Mary. Helpful ghosts teach greedy miser the true spirit of HALLOWEEN! When one of the fighters knocks out their opponents teeth, a vicious grasping mob descends upon the arena. Still no answers forthcoming regarding the whereabouts of the Transylvania Twist. The crossover : Vengeful man installs lightning rod on greedy miser's house. Does a good job but miser refuses to pay. Vengeful man take miser to small claims court and wins. Last edited by Torzelbaum; 09-28-2017 at 09:45 PM. I'd like to retroactively applaud myself for thinking of something this great and then immediately forgetting it. Man wins Evil Lottery; prize is one million dollars worth of GHOSTS! Haunted IMAX theatre airs all your nightmares in stereoscopic 3D surround sound! They're disjointed by nature and not nearly as frightening when depicted that way. Spider starts weight-lifting. Becomes swole. Farmer accidentally plants the chip from Terminator instead of corn.Grows a fine crop of Skynets! Car makes a weird noise only owner can hear. Lightning-bolt knows you were lying about your taxes. Womans entire skeleton jumps out her mouth. Must track it down before Scientists catch it! Child befriends alien visitor, and becomes ill when creature does. Alien looks like a chimp made of sausage. Recently wed couple spend honeymoon being repeatedly cursed by mummies. Too much litter on the moon; gets weighed down and falls to Earth. Man wanders into Mirror World where mice chase cats. No other discernible differences. Truly terrifying if you are afraid of LEEs. Do you mean like bad language or the other kind of cursing? Unexpected gift of breakfast in bed... prepared by Frankenstein! Mad doctor kidnaps college students and forces horrible, disfiguring, radical surgery on them. Improves patients quality of life immensely. Wins accolades in medical community. SEQUEL: Mad Doctor finds that success rings hollow, isn't any happier now that he's found fame and acceptance. Becomes sullen. Favourite movie is rewatched; there's a chill down your spine because all the actors are now DEAD! Nobody responds to your posts anymore. You think it's because everybody hates you and has you on ignore, when actually it's because you're a ghost. You meet a nice girl online and arrange to meet up. She never arrives. You think she got cold feet, but actually she was there all along, because she's a ghost. You get in a horrible accident, and afterwards everyone screams at the sight of you. You think it's because your face got mangled in the accident, but it's actually because you're a zombie. You thought I was gonna say ghost, didn't you? That's just what a ghost would think. You feel like you are being followed by a skeleton, but you just can seem to find it. Eventually, you discover it was inside you all along. One day you try shaving your beard, but your razor just passes through it without cutting it. You eventually realize that ghosts of all of your trimmed bread-hairs have decided to take up residence on your face. Your collection of amiibos comes to life when you're not watching them (like Toy Story). However, the only thing they do is eat all the veggies in your crisper drawer and detune your piano. You never notice, because you pay attention to neither of those things. You go bankrupt because of your produce expenditures. Your parents bought an area rug to block the gaping mouth on the basement's floor. Unfortunately, this means the house will soon die, so you will soon be living in a zombie house. A spider files criminal charges against you after you try killing it, accusing you of attempted spiderslaughter and claiming that he is in fact the current legal tenant of the apartment. 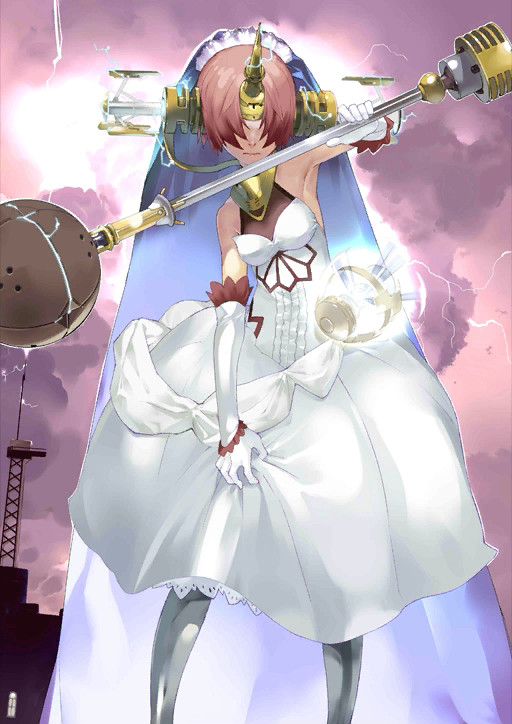 You go to jail for your crimes. Stop reading my paranoia journal! a math textbook where all the problems are framed as reminders of your own mortality. What's so terrifying about a Dracula who is too lazy to turn into a bat? OG Dracula couldn't become a bat. Jonathan Harker has that little freak out when he sees Dracula climbing down the castle wall like a lizard. 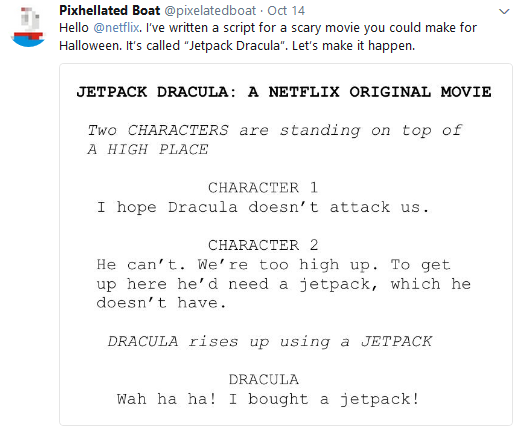 Thus Dracula's clear need to possess a jetpack!